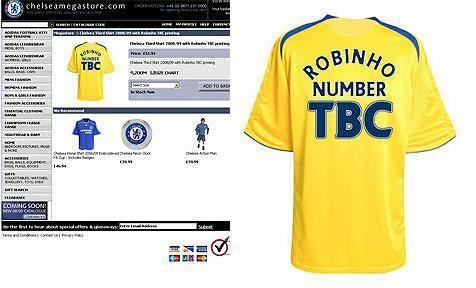 Chelsea have got some disgruntled fans after putting shirts with Robinho’s name on the back on sale on the online shop. Many Blues fans took up the offer of having the Brazilian printed on their new yellow away shirt minus his unknown squad number. But none of them had taken Sod’s law into consideration. Robinho’s move to Stamford Bridge seems to be on the rocks after his would-be replacements at Real Madrid, David Villa and Santi Cazorla, agreed new deals at Valencia and Villarreal respectively. Real have now got cold feet and have made it clear that the Brazilian will not be leaving unless they sign a suitable replacement forcing Chelsea to remove the Robinho merchandise and issue an apology. And here are some uses for the shirt if you did make the purchase! A Chelsea spokesman said: “Our online partner, Kitbag, always prepares in advance of any potential signings, and unfortunately it accidentally made its way onto the site but has now been removed.” FAIL!